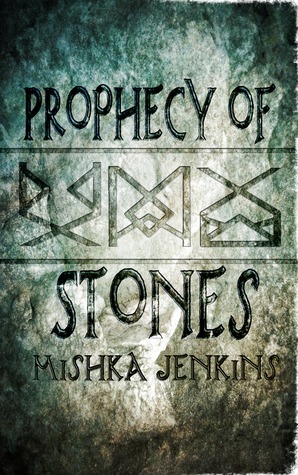 This is the third book I’ve read by Mishka Jenkins and I have to say, it had me at the title! I mean, who doesn’t love a story about a prophecy and those fated to fulfil a role which tests everything they believe in. The book begins with a group of heroes as they embark on a journey to save the world. Enter three characters who embody the heart, strength and soul of mankind, three friends who share their responsibility, and you have an appealing group who are a pleasure to spend time with. I particularly enjoyed the fact I got to experience the journey from three unique perspectives. Each of the chosen, separated cleverly by a rune marking the transition, share their insights. It makes for an exciting adventure; full of magic, mystery and intrigue. As the story began to unfold, I was well and truly hooked. One of Mishka’s strengths is developing relationships between her characters and, right from the start, you could feel the camaraderie. The kind of love and commitment which embodies the heart of the tale. The world in which they live is described so vividly a picture began to build in my head, further adding to the drama and excitement. They sucked me in, became as familiar as old friends, and I was with them each step of the way. The chosen three are distinct and exceptional in their own right. Milana is a woman worthy of her role. She is a warrior, strong of heart and spirit. I was drawn to her fierce, yet vulnerable nature and she shone with her own special kind of magic. Riff is the kind of person you can rely on; cool, calm and collected, with the kind of quiet strength which makes him a true hero. Kai’s innocence is part of his appeal and his unique perspective on the journey made the whole thing come together. The romance of the story is beautifully told, and another of Mishka’s strengths. Her male leads always stand out; lighting up a scene and grabbing a readers attention from the moment they appear. Riff is no different. The connection he has to Milana is a palpable thing. I loved this couple and highly recommend the book. Great review! I’ve read Stolen Bloodline and I’m reading The Queen’s Jester at the moment; this is certainly the next of Mishka’s books I plan to read. Thanks 🙂 The Queen’s Jester is the only one I haven’t read. It’s on my ever growing list! I bumped it up my list. I can relate to being far behind on reading though. I keep adding titles and it’s getting crazy! Plus you have been busy lately 🙂 I have two teenagers who usually ignore me, which equates to time on my hands! Thank you so much for reviewing this! And I’m so glad you enjoyed it 😀 Your the first person to review it, and I was incredibly nervous, so I’m so happy now! Thanks 🙂 I’m glad you like the site. I appreciate you stopping by.